It’s hard to imagine, but a drug that has recently been described as “a breakthrough for breast cancer treatment” almost did not see the light of day. Because of the huge costs incurred when developing a new drug, it’s not uncommon for pharmaceutical companies to pull the plug on a new treatment before it has a chance to prove itself. In fact this was the case for Lipitor – used to treat high cholesterol – which Warner-Lambert tried to kill off before it emerged as a blockbuster. Palbociclib has its origins in 1995 at Parke-Davis where a biochemist, Dave Fry, and a chemist, Peter Toogood, led the effort that identified the promising cancer drug. The key to the drug’s success is its ability to block one phase of the dividing cell cycle, thus halting the growth of cancer. There are four distinct phases to cancer cell division: M (mitosis); G1 (growth); S (DNA synthesis); and G2 (growth). 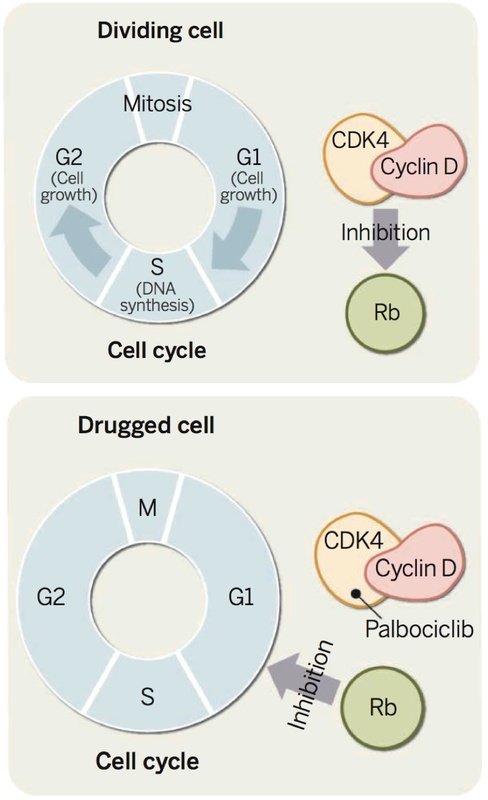 Palbociclib targets a protein called cyclin-dependent kinase (CDK), a trigger that normally enhances the G1 to S phase, thereby enabling the suppressor gene Rb to act as an inhibitor (see diagram left). Pfizer acquired Parke-Davis in 2000 and although palbociclib – known internally as PD-0332991 – showed great promise, progress stalled when Pfizer bought another drug company Pharmacia three years later. This acquisition flooded Pfizer’s pipeline with new cancer drugs that competed for limited resources. Fortunately, palbociclib was resurrected by researchers outside the company. One of these was UCLA oncologist Dennis Slamon – whose earlier research had led to the breast cancer drug Herceptin – who tested palbociclin in combination with letrozole, a standard anti-oestrogen drug. The early results were encouraging and Pfizer got excited, too. That was five years ago. Last week Pfizer submitted an early FDA application, anticipating that its Phase II clinical trial data will lead to full approval. This will be very good news for women with breast cancer, and of course for Pfizer too, with sales that could reach $3 billion a year.